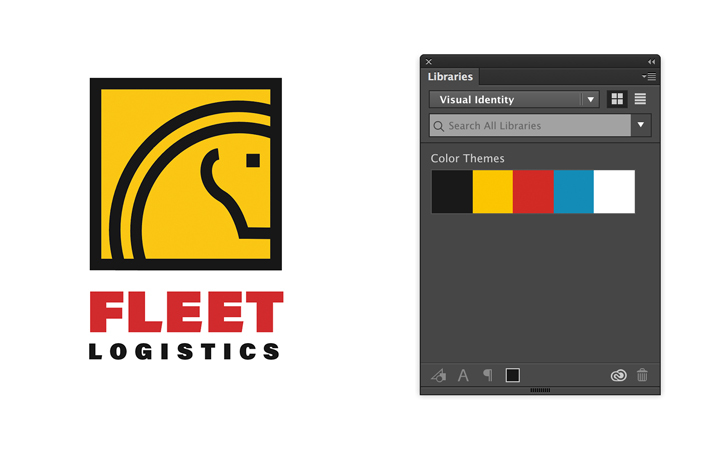 Learn how to create components of a visual identity system that include a logo, color scheme, fonts, and letterhead. A visual identity is a system of graphical elements that keeps your company's image consistent across print, web and mobile. 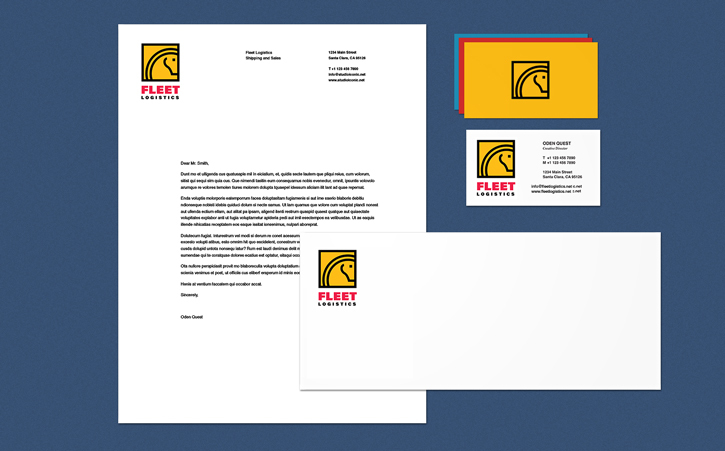 The most common applications of visual identity include business cards, letterhead and envelopes, and other business communications. Download a checklist for a typical visual identity, and start creating some of its main components below! We used a photo from Adobe Stock as a reference image for this project. In the Control panel, set the Fill color to None, and Stroke color to Black. 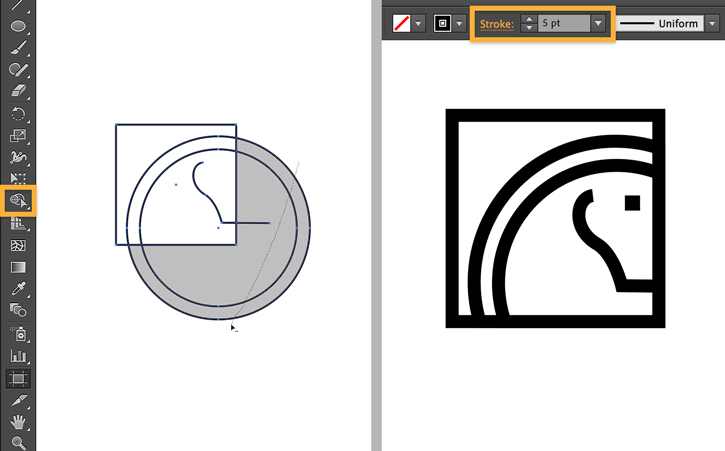 Select the Ellipse tool (L), press Shift and drag a circle. Copy the circle (Control/Command + C), and choose Edit > Paste in Front (Control/Command + F). 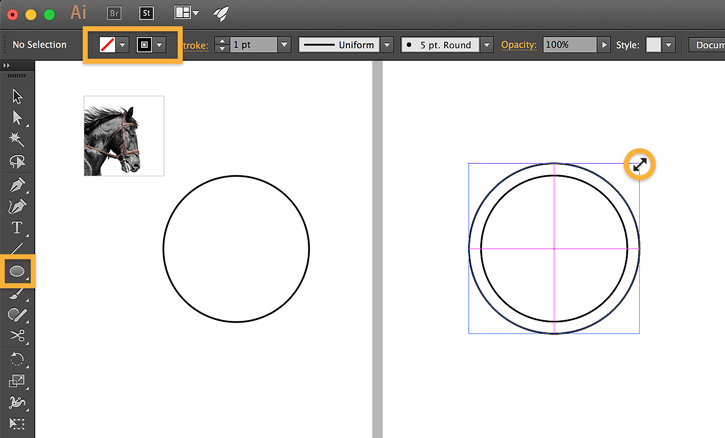 Press Alt/Option + Shift and drag an axis widget to resize the circle proportionally from the center. Select the Rectangle tool (M), press Shift and drag a square. Position it in the upper-left corner of the circles as shown. Next, select the Curvature tool (Shift + `), and draw a path as shown. Single-click to create a smooth point; double-click to create a corner point. View Draw and edit curves to learn more. Press Control/Command + A, or go to Edit > Select All. Select the Shape Builder tool (Shift + M). Press Alt/Option and drag across all elements outside the square to delete them. In the Control panel, increase the Stroke weight as desired. We chose 5 pt. 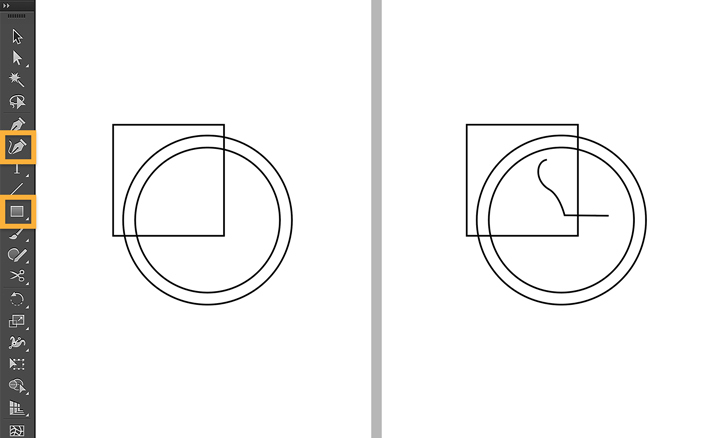 To draw the "eye," select the Rectangle tool (M), then press Shift and drag a square. Set the Fill color to Black and the Stroke to None. 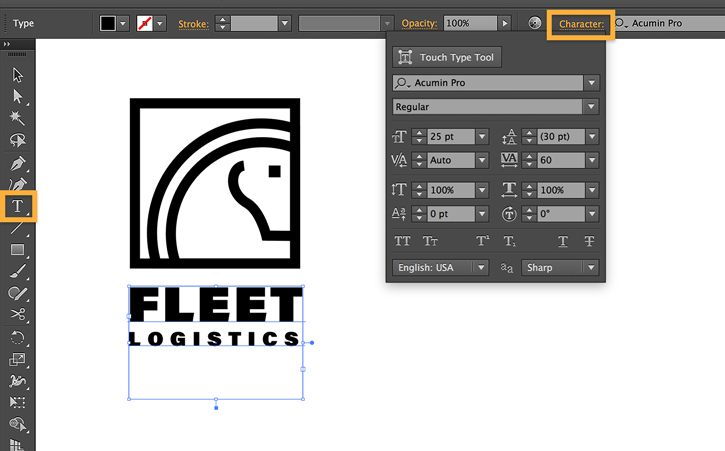 Select the Type tool (T), then click on the artboard and type your company's name. Press ESC. To resize text, press Shift and drag a corner handle. To change the font, click Character in the Control panel and choose a font in the menu. Adjust tracking, or the space between characters and adjust the font size if needed. 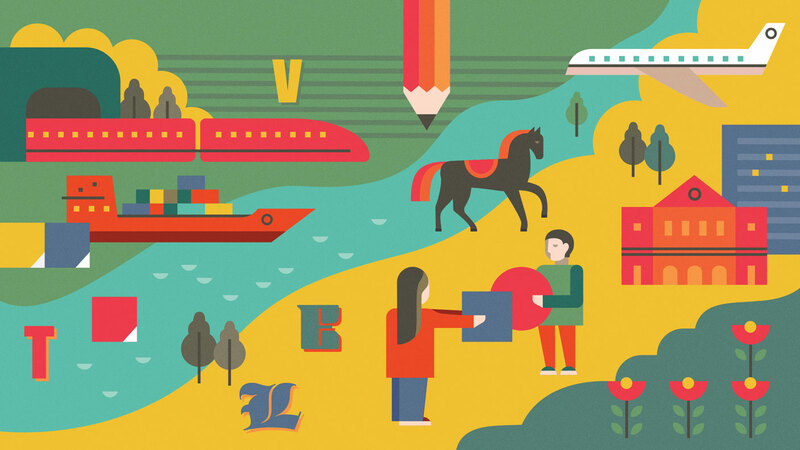 Choose an existing font, or add new fonts from the Adobe Typekit Library available to Creative Cloud members. 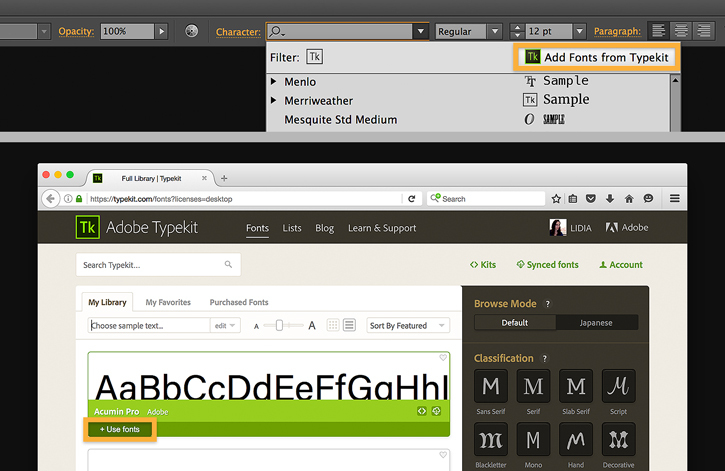 Click the Font Family pull-down menu, then click Add Fonts from Typekit. If you want to follow along, type "Acumin Pro" in the search field and click +Use fonts. Choose Select All and click Sync selected fonts. The fonts are added to your computer to use in all your projects. Use the same approach to choose fonts for use in print and digital communications. You don't have to be an expert in color theory—explore harmonious color themes in Adobe Color CC, accessed directly from Illustrator. In the Color Themes panel, click the Launch Adobe Color website button to open Adobe Color CC in a browser, then select the Explore tab. Choose a color theme and click Save. Name the color theme and save it to a library. 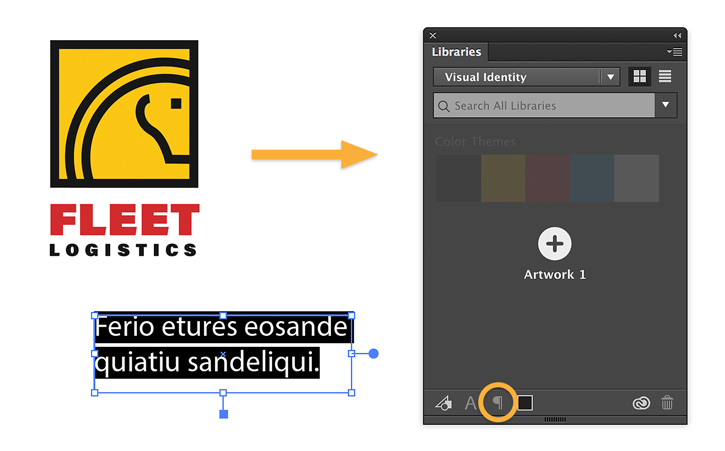 To create a new library to store visual identity elements, click the Library pull-down menu and choose + Create New Library. Name the Library and click Save. Note: You can also access Adobe Color CC directly from your browser. 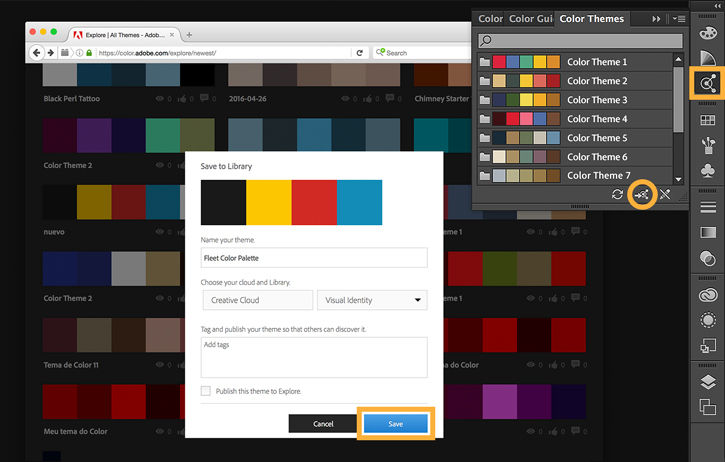 The color theme appears in your Creative Cloud Libraries panel (Window > Libraries). To apply colors, select a part of your logo and click the approprate Fill Color or Stroke Color swatch in the Control panel. Then click a color in your color theme to apply it. Tip: If the colored square hides the horse, select the square, then right-click and choose Arrange > Send to Back. Save your finished logo and other visual identity elements to a CC Library so you can organize and access them from all your Adobe desktop and mobile apps. Add assets created in Illustrator, Photoshop, InDesign, Dreamweaver, Animate CC, Adobe mobile apps, and more. You can also add assets downloaded from Adobe Stock. 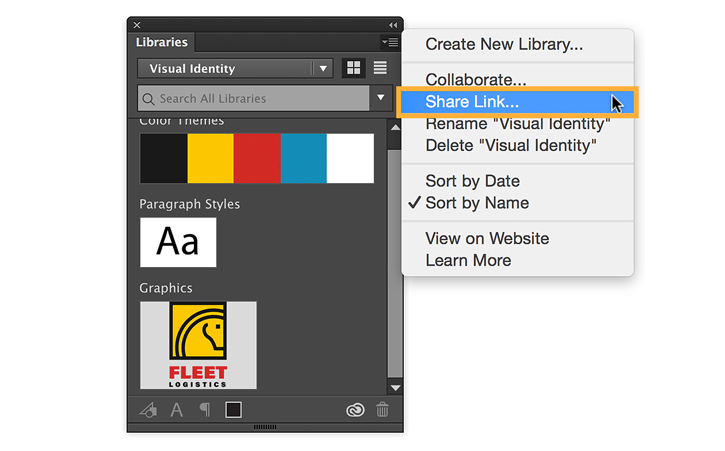 To add your logo to your newly-created visual identity library, select it, then drag to the CC Libraries panel. Alternatively, click the Add Graphic button at the bottom of the panel. To save a font style, highlight text with the Text tool, then click Add Paragraph style. Now that your identity elements are securely saved in a library for a variety of uses, share them with your team so they have the latest iterations at their fingertips. In the Libraries panel, select your visual identity library. Then open the flyout menu and choose Share Link. Learn how to collaborate with shared folders and assets.